The roof you see below is a slate roof replacement Arlington, VA that had reached the end of its service life. When slates start to turn brown or show white efflorescent half moons in their faces it is a sure sign that they have begun to deteriorate; over the past 5 years the owner had spent a few thousand dollars patching up areas where slates had fallen out or where flashings had begun to leak. When slates deteriorate they get soft and can drop out of their positions or just crack off entirely; its a long slow process when a slate roof starts giving up the ghost, keeping it on life support can get really expensive. I know what you’re thinking “I thought slate roofs last forever?”; nope, some slates from only a few quarries will last for more than 125 years, some slate veins in those same quarries can produce softer slate that is more prone to water absorption. 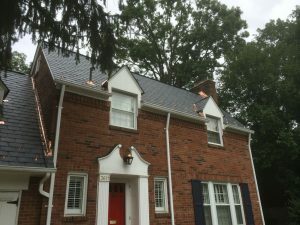 The owners decided that they were no longer comfortable dealing with a new leak every 18 months and wanted to keep water on the outside of the house; so when faced with their latest roof leak they made the easy decision to start over again with a new dependable roof. 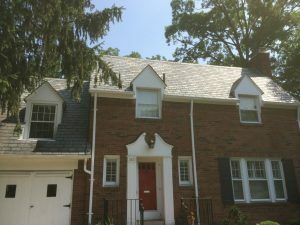 The roof you see below is an EcoStar Majestic Slate roof in Midnight Gray; these slates are made from 99% post industrial waste from plastic and polymer manufacturing (car dashboards and bumper covers mostly). There have been many imitators of so called “faux slate” roofing but EcoStar has been the innovator and leader since the products inception. My oldest EcoStar job is in Falls Church on Linden St; I pass it very few months and it looks just as good as the day I put it on 18 years ago. 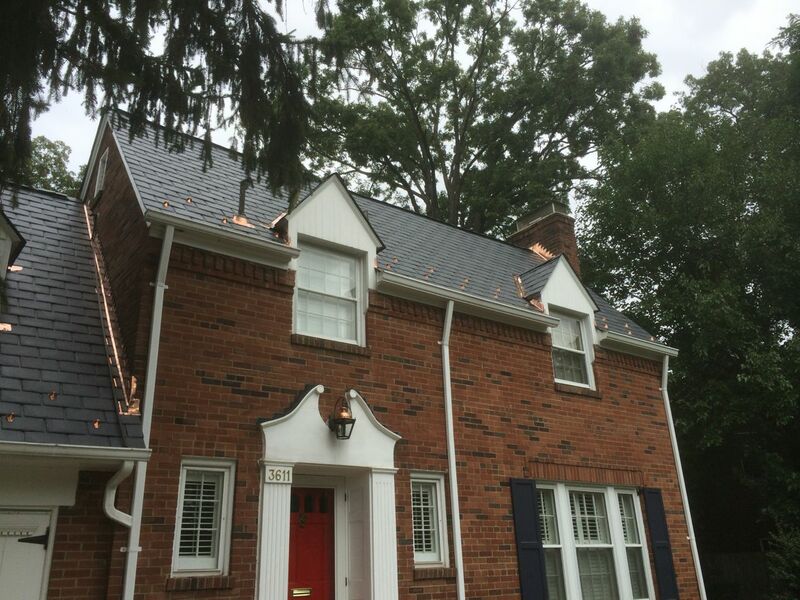 Majestic Slate will have a service life that will surpass the real slate roof I just removed from the house; since the material has such a long life it becomes critical to use flashings and metal details that will last as long as the roof will- copper is the only metal that can stand up to 100 years of rainstorms .